" Plants are not only beautiful - they are thrilling as well...."
Prominence has been given in this site to the scientific name but common English names, where they exist have been included. Greek names have also been given. It is quite common for the same Greek name to be used for a number of different plants and many of the flowers found in Skopelos don't exist in Britain, so they do not have an English name. The convention of using two latinised names to identify a specific plant or animal, the latin binomial, was introduced by the Swedish botanist Carl Linnaeus in 1745. The first name denotes the genus, a group of plants which are closely related to each other and the second the species, that is a specific kind of plant. This was aimed at simplifying names and ensuring that each plant would have a unique name, which could be recognised throughout the world and distinguish the plant from all others, a Descriptio specifica. It is interesting how many of the latinised names are based on Greek common names and many can be traced back to the names attributed to plants by the first century physician Dioscorides in his encyclopedia De Materia Medica. When the botanist Sibthorpe visited Greece in the 18th century was surprised that monks were still using this to identify herbs and flowers. The latin name in botanical reference books is followed by an abbreviation of the name of the botanist who first identified it. L for Linnaeus, Rech. for Karl Rechinger and Sibth.& Sm.for Sibthorpe and Smith. This convention has not been followed for the sake of simplicity. It was intended to simplify things! The introduction of latin binomials was meant to simplify things, so that one kind of flower would have one name understood all over the world. However, confusion continues, and many flowers have had more than one binomial attributed to them. This is not too surprising as some plants have an almost world wide distribution and there have been many botanists looking for fame, when they think they have found a new flower, they give it a new name. 1. Vascular Plants of Greece. An annotated checklist. Compiled by: Panayotis Dimopoulos et al. 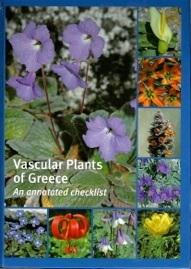 Jointly published by Botanic garden and Museum Berlin-Dahlem and the Hellenic Botanical Society, Athens. 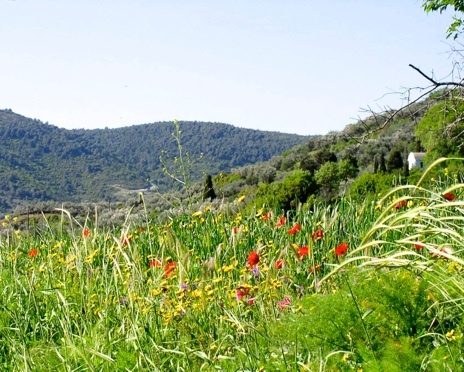 The creation of this website, The Wild Flowers of Skopelos, has brought together three interests: wild flowers, photography and Greece, in particular the Island of Skopelos, where we have had a house for over 10 years. It has also introduced me to a new interest, geology. I have been curious about flowers since childhood but only got into earnest botanising once I retired from my career as a Paediatrician. Unfortunately at times it has all become a bit of an obsession. My aim is to create a Flora of Skopelos but I have a long way to go and realise I may never complete it. I intend to include all seed plants - conifers (gymnosperms) and flowering plants (angiosperms). I will not only add plants which are rare and beautiful but also the common and ordinary. However I will follow the example of George Sfikas in his book, Wild Flowers of Crete, and omit plants that are of no special decorative interest. The great Swedish naturalist, Linnaeus, had a much grander ambition - to provide a species description for every form of life on earth.This of course was impossible, perhaps mine is too. 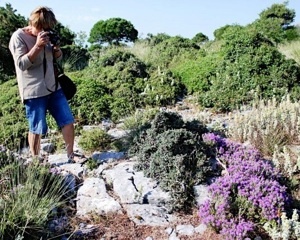 One problem is, I do not know exactly how many flowering plants there are on Skopelos. I have tried to be as accurate as possible in identifying flowers but this proved more difficult than I expected and I apologise for any errors. I am launching the site with just over 50 plants and now have almost 200 and will continue to add more and make changes. The site is not intended to be a work of botanical reference but to interest people like me, who love flowers and love Skopelos. I don't want it to be too serious. Now with over 200 flowers and trees!